As you would know by now, the ACID Board is pursuing a re-bid in 2008 for a second 7-year round of DEST funding to commence in 2009. The detailed information in relation to the re-bid process isn't yet available, because DEST must wait until after the federal election to release the 'way forward' for the CRC program. Those in the know say that the current application process might undergo a substantial revision if there is a change of government. Nevertheless, ACID's preparation is well under way. 'ACID Mark 2' will build on our current strengths and successes, while also planning to pick up some exciting new areas for exploration and research. General Manager Suzannah Conway, the Research Leaders Group and the Project Leaders have been working to firm up the ACID research program and identify potential participants for the new CRC. Project Leaders are also currently consulting with their team members. This work will inform the Board's work on the re-bid itself, which is being driven by Board Chairman Dr Terry Cutler. In the absence of detailed application processes, it is likely that a first business plan concept will have to be submitted by 31 March 2008. Successful CRCs will then be invited to submit a second, detailed plan in August 2008 before final interviews late in 2008. If successful, the new CRC will kick off on 1 July 2009. ACID hosted VSMM07, the 13th international conference on virtual systems and multimedia, at the Creative Industries Precinct in Kelvin Grove from 23�26 September 2007, plus a lead-up forum in Sydney on 21 September. A total of 140 delegates from 18 countries registered for all or part of the conference, including a number of industry representatives who registered for the special Industry Stream on 23 September. We received just under 100 academic papers submitted for peer review, and accepted 53 for presentation at the conference. Of those, 18 were accepted for publication by Springer Lecture Notes in Computer Science (in press now). All others have been made available to delegates in the conference proceedings. A highlight of the conference was the closing presentation by Professor Mark Burry of RMIT�s Spatial Information Architecture Laboratory. Mark's presentation highlighted the use of ancient and modern tools in the continuing construction of the Temple Sagrada Familia in Barcelona, Spain � everything from slide rules and hand-worked sandstone to aviation-design software and 3D rapid prototyping. He delivered his presentation via Skype video from Barcelona, Spain, in real time � proving the concept of virtual systems on many levels. VSMM07 sponsors included the Museum Victoria, VR Solutions, and the Queensland Department of State Development which sponsored the Queensland Government Industry Prize awarded to Helen Travers, Ernest Hunter, Julie Gibson and Jonathan Campion of the University of Queensland in Cairns for their paper Pride and Performance: Innovative multimedia in the service of behavioural health change in remote Indigenous settings. ACID is proud to announce it is the major sponsor of the Doctoral Colloquium at OzCHI 2007, the Australasian Computer�Human Interaction Conference to be held 28�30 November at the City West Campus, University of South Australia in Adelaide. The Doctoral Colloquium offers PhD students a forum to present and discuss research plans with peers and established senior researchers. ACID Research Leader Dr Margot Brereton will chair the OzCHI Doctoral Colloquium. For more information visit the OzCHI colloquium site. ACID Project Leader Ian MacColl demonstrated the IWALL at the Next Level Festival of technology, music, art and games on Friday 26 October. Ian's demo was part of the 'Stranger Than Fiction � The Real Time City' session presented by iCi, featuring a talk by Professor Carlo Ratti of the MIT SENSEable City Laboratory plus demonstrations of new media for urban applications. Ian said the trade-show style demonstrations offered good opportunities for networking with people from a range of organisations outside ACID's regular contacts. 'The demos showed a real diversity of work, from new urban media to mobile phone applications, shared storytelling to urban interfaces,' he said. 'I'm already following up a couple of new opportunities that came up on the day. Media/Culture, the website at the crossover between the popular and the academic in media and culture, has published Ann McLean's review of Intimate Transactions: Art, exhibition and interaction within distributed network environments, the book of the exhibition that was part of ACID's early ACIN project. McLean said the book is a slick catalogue of well-written articles, each presenting a different angle on the 'tactile, weightless, animated beauty' of the collaboration. To read the review in full, visit the Media/Culture site. STOP PRESS:Intimate Transactions has secured DCITA �Visions of Australia� funding for an eight-date regional tour of Australia throughout 2008�09. Congratulations Keith! The Queensland Government has mentioned ACID�s diversionary therapy project in its 2007�2008 program document outlining the State�s ongoing strategy, Creativity is Big Business � A framework for the future. Of course, this is the research and development conducted by ACID in consultation with the Burns Unit at the Royal Children's Hospital Brisbane and transferred to our spinoff company Diversionary Therapy Technologies Pty Ltd. Calling all ACID Researchers: If you�d like to let others at ACID know when and where you�re publishing, just send the details to Litmus. A UTS graduation ceremony on Friday 28 September saw the first three PhD graduates from the Creativity and Cognition Studios at UTS: Dave Burraston, Alastair Weakley and Greg Turner. Alastair and Greg are members of the ACID family: Alastair is a post-doc researcher on the Virtual Communities program, and Greg was a research assistant on the Creative Collaboration project. ACID Project Leader Professor Ernest Edmonds, of the Creativity and Cognition Studios at UTS, has an exhibition this month at the Conny Dietzschold Gallery in Sydney. The Digital Paintings � New Media Installations exhibition will run until 31 October at 2 Danks Street, Waterloo, 11am�6pm Tuesday to Saturday. ACID researcher Deborah Turnbull, also of CCS at UTS, curated the 'Correspondences in Sound and Vision' performance event on Sunday 30 September at the Carriageworks site at the old railyard in Eveleigh, Sydney. The main event of the evening was a performance of Port Hacking and DC_Release by Ernest Edmonds and UK artist Mark Fell. 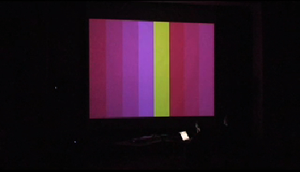 Guest performers included ACID's Associate Professor Andrew Brown in a live coding performance by aa-cell. UTS PhD student Brigid Costello on play and exploration in audience engagement. The call for entries to the D&AD Awards 2008 has just gone out, with the release in the first of a series of animated films by Saatchi & Saatchi London. Inspired by everyday debates in agencies and studios over the merits of a new idea, the films interview leading creatives who reveal how they developed that great idea and produced work that colleagues, clients and juries wished they�d thought of. The D&AD Awards recognise innovation with 'Yellow Pencils' awarded for Graphic Design, Mobile Marketing, Broadcast Innovations, and Magazine & Newspaper Design. The entry deadline is 16 January 2008, and full details are available online.